I wore this vintage (1970s) dress to the Liberty’s party. I wore this vintage suede skirt and Shu-Ba top (feathers added) to the METAL/Lina Osterman party. I wore this satin kimono and leather obi sash to the PPQ show. Martin wore this to the METAL/Lina Osterman party. Check out the miniature birdcage necklace. 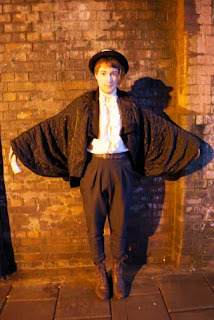 Martin wore this to the Roisin Murphy / Linda Farrow party. Cape, shirt, hat vintage. 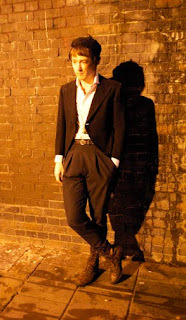 Martin wore this to the PPQ afterparty. Couture trousers by Sara Loi. Coat by W.S. Wilkenson & Sons. Margo Fortuny is a writer and artist based in New York and Madrid. Her work has appeared in The New York Times, Exit, Flaunt, Buffalo Zine, Vice and Metal, and online at Dazed Digital and SHOWstudio.com. She also writes short stories, scripts and comes up with award-winning apps and digital platforms. Check out her photography on Instagram @thefortunyverse and drawings: @margofortuny . Send your thoughts and any writing assignments to pensforeverything (at) gmail.com . All text and photographs are by Margo unless otherwise specified. Get in touch first if you'd like to use any images or excerpts.